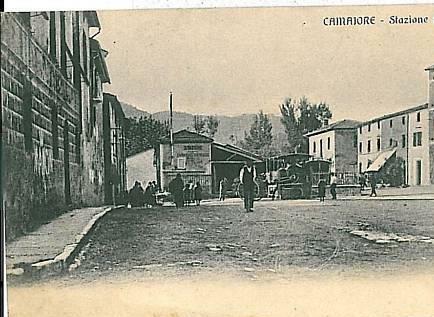 Camaiore may be reached by a tramway from Viareggio, or by a pleasant drive from Massa in a couple of hours, or in about an hour from Pietra Santa. The piazza is entered through a castellated gateway, all that remains of the mediaeval fortifications. The Collegiata of Sta. Maria Assunta was built in 1278. It has, however, been restored in an uninteresting manner. Over the door is the sacred monogram given to the citizens by S. Bernardino of Siena, with the promise that its due veneration would protect against plague. 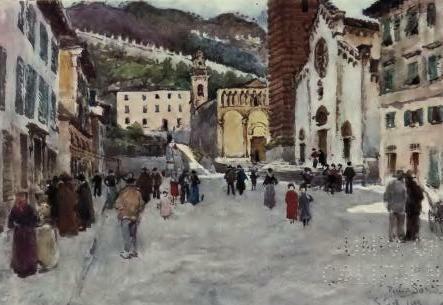 To the right of the main street is the small Church of S. Michele, said to date from the eleventh century. Following the street to the east end of the town, and turning to the left brings the visitor in a few minutes to the Badia, a Benedictine church supposed to date from the eighth century. The abbey was destroyed in 1400, but the church, although recently restored, retains its original character. The little piazza is entered through a fine gateway. To the right of the church is a pretty cloister. The campanile is modern. The general effect of the interior is very good. The masonry is of fine quality; the forms are simple and the design spacious. The round arches of the nave arcade rest on five piers: nave and aisles are covered with wooden roofs. Over the altar is a picture in five compartments, Madonna and Child with saints, on a gold background set in a pointed design. It is not to be imagined that Viareggio is the same quiet little place we know, and enjoy, all the year round. Far from it! It has its ‘season’ (I trust I may never see it), when all the hotels and pensions are full to overflowing, and the attractive little houses are let to visitors. All the little wooden booths on the Piazza d’Azeglio, facing the sea, which are for the most part closed in spring, are then thrown open, as are also the long lines of bathing establishments running down across the sands. The theatre, also made of wood, and the race meetings provide amusement: so it must indeed be a different Viareggio from the quiet little place beloved of artists in the early months of the year. 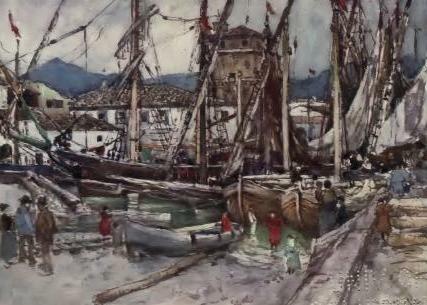 Then one meets many brothers of the pencil and the brush working busily in the little harbour full of shipping, or higher up the canal, where the boats unload, or down in the shipbuilding yard. Besides these there are endless beauties in the scented pine-woods to tempt them, and all the wonderful effects of sea and sky. To the west lies Pietra Santa, where also many an attractive subject can be found on the fine piazza, with the quaint, old-world city gate, the facade of the church, and the curious line of fountains against the hill, which rises steeply behind the little town. Any one in search of tranquillity, complete repose from social duties, leisure to do whatever he or she likes best, from the not necessarily early hour of rising until bedtime, to such a man or woman let me recommend Viareggio in the dull season. This aspect of Viareggio is the only one I know; and though to others the little town may wear a deserted look in early spring, to me it is a haunt of peace, which induces that charming feeling one has when there are no duties waiting to be performed— only long sunny hours in which to enjoy mornings, afternoons, and evenings, of dolce far niente. To appreciate all that is meant by this delightful Italian expression, one thing is necessary at Viareggio – either to have a sympathetic companion, or to be alone. Otherwise one might find oneself in a trying position. It is impossible to lose any one here, and short of locking oneself into the hotel bedroom, which is home for the time being, one could not shake off an uncongenial associate. Viareggio is situated on a beautiful corner of the Mediterranean coast, which here forms a series of shallow bays. All along the sandy beach are vast stretches of pine-woods, and behind them rise the great ranges of the Carrara mountains. The tall umbrella pines catch the sunlight on their spreading tops in a thousand different tones. It reddens their wind-bent trunks, and touches with gold the gorse and the vivid green of the young grass at their feet. In spring-time the Carrara mountains are still snow-sprinkled, and their jagged peaks stand boldly up against the deep blue of the sky. Drifting clouds wreath them, and on their slopes white red-roofed villages perch, each clustering about a tall church tower, and making a patch of light on the amethystcoloured mountain-side. The pictures framed by the tall pine-stems are for ever changing. Here, on the one hand, are the mysterious mountains; and on the other is the sea, glittering and sparkling, beyond the golden sands, through the gloom of the woods – sometimes blue, and sometimes purple, and sometimes green, while the rhythm of the plash of the waves on the sea-shore answers the sigh of the breeze in the tree-tops. Viareggio proper, which lies away from the pine woods, is a small fishing town with a population highly reputed for honesty, theft being unknown. The town is composed of rows of straight streets with low green-shuttered houses, bounded on the north by the railway line that runs to Genoa, and on the south by the sea. Those quiet little houses in the broad sunny streets wear a homelike attractive air, though most commonplace in architecture and with little variety about them. All show the same peculiar features—a large door with a window on either side, three windows above, and a flat roof. The ground-floor windows go down to the street pavement, and are thrown wide open all day long in fine weather; no precautions are taken to keep people out. Once I saw a low wooden barrier fitted inside an open window; but it looked a very inadequate protection, and easy to be stepped across. It appeared to me that the only reason for its presence must be a desire to keep out the Viareggio dogs.